There are merges that do something special like ##SEARCHBOX##. This will evaluate to a search box with a submit button next to it. There are merges that have settings like ##EXTERNALCONTENT[http://www.google.com]##. The settings can give it more information and allow it to be customized. Shared Content Merges, defined in the Site Explorer, can be used just like a pre-defined merge code. Typically they are used to share text across on multiple storefronts while keeping a single instance for easy updating. ##SESSIONADCODE## - Displays the adcode from the visiting session. This merge code is available throughout every page in the system, not for emails. ##SESSIONAFFILIATECODE## - Displays the affilate code from the visiting session. This merge code is available throughout every page in the system, not for emails. ##SESSIONCUSTOMERTYPE## - Displays the customer type set on the visiting session. This merge code is available throughout every page in the system, not for emails. ##SESSIONCUSTOMERTYPEID## - Displays the customer type ID set on the visiting session. This merge code is available throughout every page in the system, not for emails. ##SESSIONSOURCE## - Displays the visitor source (Google, Bing, Yahoo, PPC, etc.) where a customer came to the site from. This merge code is available throughout every page in the system, not for emails. ##SESSIONSOURCEGROUP## - Displays the visitor source group (unknown spider, search engine in the case of referring domain, etc.) This merge code is available throughout every page in the system, not for emails. ##CATEGORYDROPDOWN[catID=447~451,width=100px,defaulttext=Select...]## - A dropdown list of the categories and it's subcategories, when you select one it navigates to that page. ##MANUFACTURERDROPDOWN[width=100px,defaulttext=Select...]## - A dropdown list of store manufacturers, when you select one it navigates to that page. ##LOGINLOGOUTLINK## - A login/logout merge that will flip flop between login and logout based on the customer's login status. ##LOGINMESSAGE[message=Welcome ##CUSTOMERFIRSTNAME##! ]## - Notice this is a merge within a merge. To get a comma, use the character entity code for it: #44 (without the space after the ","). ##CUSTOMERLOGIN[Width=123,Class=XYZ,ButtonImage=/images/btnLogin.gif]## - Allows you to position the login form anywhere in your site. ##EMAILPAGELINK## - Allows you to send the current URL to a friend or coworker, it just sends a URL of the page by email using the standard email client at this time. ##EXTERNALCONTENT[http://www.externalurl.com/filename.htm]## - Will pull the content from an external source and put it right there on the page! ##EXTERNALCONTENT[/page.html]## - References the external file relatively with a leading "/"
URL can be external (http://www.google.com/registration.html ) or internal (/store/pg/3-test.aspx). It just reads the content of the form into an iframe. The 2nd value will override the height of the iframe. ##QUICKADDTOCART## - This puts a text box where when an item number is entered into it, it will add that item number and a quantity of 1 to the cart. Does not work if the product has variants or personalization. ##SEARCHBOX[catID=15|16|17]## - Optionally show a category dropdown containing the categories listed to limit the search to those categories. List must be a pipe (|) delimited list of category IDs. Category IDs can be found on the category list page. ##SEARCHBOX[autocomplete=true]## - Turns on auto completion and will search the catalog for whatever is typed and show a dropdown of options. ##SEARCHBOX[class=AutocompleteSearchBox]## - A standard search box but the CSS is the same as an Autocomplete search box. $$NORESULTS$$ - Displays a message when no search results are displayed. "Sorry, your search query did not return any results". ##AMAZONLOGIN## - Used to place Login With Amazon buttons. By default, this redirects back to the page where the button was clicked. Alternatively, you can use ##AMAZONLOGIN[/some/other/redirect]## to redirect the customer to a specific URL. 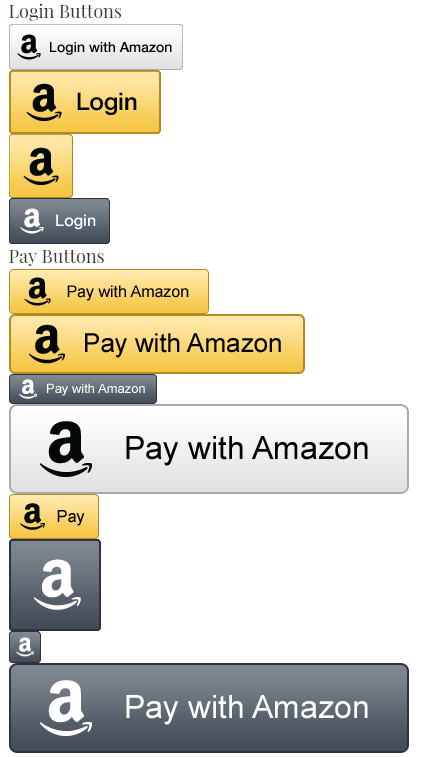 ##AMAZONPAYBUTTON## - Can Specify the type, color, and size of the button in the merge code as well as the ##AMAZONLOGIN## merge using the values specified here. ##HTMLENCODE[ ##MERGECODE## <tag> ##ANOTHERMERGECODE## ]## - html encodes anything placed inside the brackets including other merge codes. $$BLOGCOUNT$$ - total blog posts + blog matches. ##CARTITEMSCOUNT## - Shows just the number of items in the cart. ##CARTSHIPPING## - shows the shipping amount for the cart if a shipping method has been selected. ##TRIM## Content ##ENDTRIM## - Trims content to a specified number of characters. ##PRICEOF[ID=10]## - Displays the price of the product with the indicated ID. ##QUANTITYPRICEGRIDOF## or ##QUANTITYPRICEGRIDOF## - Displays the advance pricing of the current product or of the product belonging to the passed in ID. ##PAYPALEXPRESSCHECKOUT[size=small]## - Displays the PayPal Express Checkout button. Size of this button can be either small or large. ##GOOGLECHECKOUT[size=small,bg=white,variant=text]## - Displays the Google Checkout button. Size can be "small," "medium," or "large," background color can be "white" or "transparent," variant can be either "text" or "no-text." ##GOOGLECUSTOMERREVIEWSBADGE## - Displays the Google Customer Reviews rating badge if you have Google Customer Reviews enabled. $$AMAZONCHECKOUTBUTTON$$ - displays the checkout by amazon button on the shopping cart page. ##HIDEBYID## - Prevents an element from rendering. ##CURRENTDATE##- Displays Text Formated Curent Date ##CURRENTDATE## "8/30/2010" ; ##CURRENTDATE[yyyy]## "2010" ;##CURRENTDATE[yyyy/MM/dd]## "2010/08/30"; ##CURRENTDATE[yyyy/MM/dd hh:mm]## "2010/08/30 09:45"
##QUERYSTRING[name]##- Displays the value from the querystring and put it in place of this merge. ##ACCEPTEDCREDITCARDLOGOS## Will display logos for the store accepted credit cards. ##JSENCODE[…]## - encodes a string for use inside quotes, useful for merge codes inside JS. ##CARTTOTALWEIGHT## - Displays the total weight of all items in the shopping cart. ##CHILDPRODUCTMERGELIST## - Run any merge code against a products child items and return the values as a configurable delimited list. For example, ##CHILDPRODUCTMERGELIST[ITEMID]## would run the ##ITEMID## merge against all the child products and return them in a delimited list, such as: 12,45,103. Additionally you can change the separator by passing a separator parameter, and the values can be individually quoted by passing quoted=true. ##CHILDPRODUCTMERGELIST[PRODUCTSTATUS,separator=|,quoted=true]## would return the status of each child products wrapped in quotes, separated by a | character. ##STOREPRODUCTAVERAGERATING##: displaying average review rating for all products from a store. ##STOREPRODUCTREVIEWCOUNT##: displaying total review count for all products from a store. ##LOGO##: Returns an image tag of the stores' invoice logo. ##CATAVERAGERATING##: displaying average review rating for all products from a category. ##CATREVIEWCOUNT##: displaying total review count for all products from a category. Used in conjuction with the "Facebook Application ID" setting on the Advanced tab of the Theme Manager. The xid for the Facebook comments tag is a unique identifier that it uses to store the comments for a given page or item. If you wanted the comments to be shared across a category you could provide the category ID. If you wanted them for a particular product you could use a product id or an item number. Note: The default value for a URL is not a valid xid value, if you plan to use a URL, it has to be encoded. We support all of the same options. ##FACEBOOKLOGIN## - can be used to place a facebook login button almost anywhere instead of just on login pages. Typically used in affiliate emails sent from the affiliate system. These work in emails that have subscription context. ##SUBSCRIPTIONNEXTDATE## - Displays the subscription's next due date. $$ITEMSUBSCRIPTIONINFO$$- Allows the subscription frequency to be displayed in cart on View Cart Page. Cart Based Merge Codes work in emails that have cart context. ##CARTITEMS## - Displays the contents of the cart. ##CARTITEMSHTML## - Displays the contents of the cart in HTML format. ##CARTLINK## - Gives a link to an existing cart. ##CARTTYPE## - Displays the cart type. ##CARTNAME## - Displays the cart name. These work on screens and emails that have order information accessible such as order alert emails, order confirmations, order specific tracking scripts, etc . ##GOOGLEREMARKETINGPAGETYPE## - Renders ‘home’, ‘searchresults’, ‘category’, ‘product’, ‘cart’, ‘purchase’, or ‘other’ depending on store page type. ##GOOGLEREMARKETINGTOTALVALUE## - On a product page renders ‘##RAWPRICE##’, on cart and checkout it renders the raw subtotal, and on order view renders the raw total. ##PAYMENTDECLINEDREASON## - Displays any response from the payment gateway as the declined reason. ##MFGPARTNUMBER## - Recently added MGPARTNUMBER and MFGNAME merges for order items. This allows the ##MFGPARTNUMBER## merge code to work on the order view page. $$SHIPMENTSHIPPINGMETHOD$$ - Works on Order View page. Pulls the last shipping method listed in the order’s shipping method list. This duplicates the functionality of the email ##SHIPMENTSHIPPINGMETHOD## merge code. ##ORDERITEMLISTQUOTED## - Generates a list of all items (by SKU/Item Number) on the order enclosed in single quotes and separated by a comma. ##ORDERITEMLISTQUOTEDWITHQTY## - Generates a list of all items (by SKU/Item Number) on the order with the corresponding quantity enclosed in single quotes and separated by a comma. ##ORDERITEMLISTQUOTEDWITHPRICE## - Generates a list of all items (by SKU/Item Number) on the order with the corresponding price enclosed in single quotes and separated by a comma. ##ORDERQUANTITYLISTQUOTED## - Generates a list of the quantities of all items on the order enclosed in single quotes and separated by a comma. ##ORDERPRICELISTQUOTED## - Generates a list of the prices of all items on the order enclosed in single quotes and separated by a comma (rounds to 2 decimal places). WebTrends Ad Director Beacon Tracking. ##ORDERITEMLISTWEBTRENDS## - Populates the tracking script with order item information. ##ITEMTOTALCOST## - returns the item’s cost multiplied by its quantity when used in the Order Item context in emails. ##MANUFACTURERINVOICENUMBER## - Displays the manufacturer invoice number assigned to the order. ##ORDERPAYMENTLINK## - Order payment link generated on the order edit page to send a payment link to the customer. ##PAYMENTMETHODWITHAMOUNTS## - will render not just the payment method names, but the amount of each payment method in parenthesis. ##PAYMENTMETHODWITHCC## which will render as "Visa xxxx-1234 ($12.34)"
##SHIPDATE## - This is the date that the order status is changed to shipped. ##SHIPPINGNOTICE## - Displays information about shipping restrictions, call for shipping, etc. ##INFOITEMS## - An item added to the cart that is visible to the store owner but not the customer i.e. : "This order came from my blue email template"
##CATEGORYCUSTOMFIELD[fieldname]## - Custom fields created for categories, and used via merge codes and import/exporting. ##SORTEDWAREHOUSEORDERITEMS## - For order emails sent to warehouses. Uses GTIN/UPC field to sort products. In the event that the UPC field is not populated, these items will be added to the bottom of the sorted list. ##SHIPMENTSHIPPINGMETHOD## - Pulls the shipping method stored on the shipment. If no shipment record is found, it defaults to the ##SHIPPINGMETHOD## value. $$TOTALSHIPPINGWEIGHT$$ - Outputs the entire weight of the order. ##ITEMIMAGEURL## - displays the image in the order confirmation email. ##ETADATE##- displays the ETA date specified on a given product. requires "Show ETA Date" checked in the theme settings. ##TIMEFRAME##- displays the "usually ships in" text specified in product statuses. All product merges technically can be accessed here as well, but if you delete the product they will no longer render, such as for older orders. ##ITEMSHORTDESCRIPTION## - Pulls the items' short description. ##ITEMDESC## - Pulls information about the product, including variations, customizations and Line Item Notes. $$GIFTCERTIFICATEAMOUNT$$ - Outputs the amount left on a gift certificate. Only works on the Customer - My Account page. ##GIFTCERTIFICATETOEMAIL## - Obtained from the optional personalization fields on the Gift Certificate eProduct or on the Gift Certificate Edit screen. ##GIFTCERTIFICATETONAME## - Obtained from the optional personalization fields on the Gift Certificate eProduct or on the Gift Certificate Edit screen. ##GIFTCERTIFICATECODESCSV## - Lists all gift certificate codes in a comma separated format. Can be used to send multiple codes to a customer via an email template. ##LASTPAYMENTSTATUS##-Success/Declined, last time the subscription renewal was attempted. ##TOGGLEENABLED##-Enable/Disable - Opposite of current status as an action word. Can be passed via QueryString along with SubscriptionID to MyAccount to swap status. $$ITEMSUBSCRIPTIONINFO$$ - Allows the subscription frequency to be displayed in cart on View Cart Page. ##EPRODUCTS##- Creates the link to the eProduct. Text Only. ##EPRODUCTSHTML##- Creates the link to the eProduct. Clickable. Use in HTML format e-mails only. ##COUPONCODE## - Displays the coupon code used for an order. These are used on the order invoice page in the custom layout editor. $$RMAREASONLABEL$$ - Label for the dropdown editor, defaults to "Reason for return:"
Mailing List Widget: $$PHONENUMBER$$ - When used, a customer account will be created with this phone number as the default. $$MAILINGLIST$$ - Adds the mailing list subscribe text box field to allow the customer to enter their email address to subscribe to the store's active mailing list. Customer Based Merges - Email Templates. ##CUSTOMERNUMBER## - External Customer Nr from the customer account on the General tab. These work in spots were all customer merges work where a customer has context, like order emails and myaccount page. Will not work on general locations like the home page. ##REMOVEFROMDRIPSERIESURL## - Adds an Unsubscribe link to the email to unsubscribe from the mailing list. Customer Based Merge Codes - My account page. These are used site-wide and pertain to the specific store the customer is on. These are used at the end of a URL for the "Subscribe URL:" text box underneath "UrlBased List Settings". Used on the product details custom layout editor. $$PRODUCTFLAGS$$ - Pulls in an image for the flag if any are active. $$NOTIFYME$$ - Displays the Notify Me link for an out of stock product. $$CITY$$ - Only works on Shipping Estimation page. Hook up state dropdown with country selection. $$REVIEWCOUNTLINK$$ - Displays a link to view the product reviews for the currently displayed product. $$WRITEREVIEWLINK$$ - Displays a link to a page where the customer can write a product review for the currently displayed product. $$AVERAGEREVIEWRATINGSTARS$$ - Displays the average "star" rating rating calculated as the sum of ratings divided by the count of product reviews that have been submitted and approved for the product. ##ITEMPHOTOURL## - displays the item image in email templates, such as "Order Approved"
##YOUSAVELABEL## - Label for You Save merge. Default: "You Save:"
showall - shows all 3 values, attribute group, attribute and attribute value. link: will create a hyperlink for the item and point it to an attribute listing page with other products that have the same attribute as the one selected. ##PRODUCTSTATUS## - product status like In Stock, Discontinued, etc. ##QUANTITYONHAND## - in stock quantity on hand. ##ITEMWEIGHT[decimalplaces=? ]## - ? represents the number of decimal places to use. ##TELLAFRIEND## - Displays the Tell A Friend link that will open in a Highslide popup. Products can have "Multiples of Quantity". If this is any number other than 1, quantities of any product added to or updated in the cart are rounded up to the next nearest multiple of this value. For instance, if this value is 5 and 2 are added, the quantity is adjusted to 5. If 6 are added, the quantity is adjusted to 10. ##PRODUCTCOLUMNCSSCLASS[…]## - This merge code is used on Product Listing pages such as the category page, search page, manufacturer page, as well as in Product Display widgets. The purpose is to allow the flexibility of responsive design as well as allowing the “Products Per Row” settings to still work. The merge code takes in a list of settings to correspond to the Products Per Row value. ##REWARDPOINTSEARNED## - for product details page. Allows customer to show the points earned for the current product being viewed. Includes variant drop down support. Set Item By ID merges:Allows you to process product based merges based on an item in the cart. Product based merges placed here will be evaluated based on the item specified above. ##SETITEMBYCARTINDEX##-the valid numbers are 0 – (n-1), where n is the number of items in the cart. ##ITEMNAME## is the best product. ##AVAILABILITYSCHEMATYPE## - Merge for products that renders as either InStock or OutOfStock. Meant to be appended to a schema URL to specify availability. ##IF[StoreID=1]## sample text ##ELSE## sample test ##ENDIF## (else is optional) - Used to differentiate text in product descriptions and other fields on a per store basis. ##IF[datebetween=1/1/16 AND 12/31/16]## content ##ELSE## content ##ENDIF## - Checks that the current date is between the specified date range. ##IF[ProductStatus=Out of Stock]##$$AVAILABILITY$$ ##ELSE## ##ENDIF## Can be used to only show availability when out of stock. $$CUSTOMMESSAGE$$ - Simple message for visitors to your cart page, store text so you can put it in multiple languages. Used on the catalog page custom layout editor. ##VARIANTINVENTORYDETAILTABLE## - will return variants, status, and price for the product if not using variant inventory, or all variant inventories of the product if the product is using variant inventory. .
$$STOCKSTATUSFILTER$$ - Works on Category, Manufacturer, Search and Attribute theme pages. It will display a dropdown list with all the product statues that are not hidden. Upon selecting a value, the page will refresh and show only products with that product status. $$STOCKSTATUSFILTERBOTTOM$$ - Works on Category, Manufacturer, Search and Attribute theme pages. Displays a dropdown list with all the product statues that are not hidden. Upon selecting a value, the page will refresh and show only products with that product status. ##CATICON## - Displays the Category Icon path. ##CATTHUMB## - Displays the Category Thumbnail path. ##ROOTCATNAME## - The top most category in the tree of the selected category you are currently on. Dvds > Action > Mel Gibson...Dvds is the root, no matter where in the tree you are at. ##ROOTCATICON## - Displays the root category's Category Icon path no matter where in the tree you are at. ##ROOTCATTHUMB## - Displays the root category's Category Thumbnail path no matter where in the tree you are at. ##REVIEWCOUNT## - Displays the number of product reviews that have been submitted and approved for the product. ##AVERAGERATING## - Displays the average rating calculated as the sum of ratings divided by the count of product reviews that have been submitted and approved for the product. ##SHAREDCONTENT[nameofsharedcontentmerge]## - Adds a shared content page to a content page. ##CARTITEMS##s - A list of items in a customer's cart in text format. Site level theme merges, not available in emails. ##ACTIVEROOTCATEGORYURL## - Shows the active root category url link, based on Active Catalog/Microstore/etc. Advanced Only!When using custom site layout of your entire template, place these merges within your HTML to put the AmeriCommerce online stores generated content within the theme. $$HEADER$$ - The header of your site, typically above the top navigation, tied to the 'Page Header' area of the AmeriCommerce online stores theme system. $$TOPNAVIGATION$$ - Typically below the header, can contain snapins including dropdown menus or link groups. $$MAINCONTENT$$ - The content area of your site, changes by page type. $$LEFTCOLUMN$$ - Left column of your site, usually contains link groups and other snapins, tied to the "Left Column" area of the AmeriCommerce online stores theme system. $$FOOTER$$ - Footer of your site, usually contains link groups and other snapins, tied to the "Page Footer" area of the AmeriCommerce online stores theme system. $$RIGHTCOLUMN$$ - Right column of your site, usually contains link groups and other snapins, tied to the "Right Column" area of the AmeriCommerce online stores theme system. ##EXPORTNAME## - Name assigned to the scheduled export. ##TIMESTAMP## - Can accept parameters like ##TIMESTAMP[yyyyMMdd]## to change the format of the timestamp. ##STORENAME## -- Returns current store name. $$QUOTEEXPIRATION$$ - Only works on the quote layout page. $$ATTRIBUTEANDVALUE$$ - Displays the attribute's name and value (this merge code made specifically for product comparison page to be able to display values for attributes like height, width, length, etc). The conditional mergecodes listed are the only ones available for performing logic. The new design of this page with the collapsing sections makes it hard to find merge codes by using CMD+F. Paul, click "Expand All" and you're good to go.
" ##LOGINMESSAGE[message=Welcome ##CUSTOMERFIRSTNAME##! ]## - Notice this is a merge within a merge. To get a comma, use the character entity code for it: #44 (without the space after the ","). " I have tried this, and I get "#44" rather than "," in my display. Please explain a little more. "#44" needs to be wrapped in "&" and ";" in order to be recognized as an entity code. So if you use "," instead of "#44", you should be good to go. You can see additional entity codes at http://www.w3schools.com/tags/ref_entities.asp. Put content here, ##CUSTOMERFIRSTNAME##, and here. Blake thank you a lot for the &; wrapper (worked fine) and the link (W3 schools tab is usually open in my browser). Ryan, thank you. I have that If statement working. However, I don't know how to get rid of the comma when a customer is not logged in, i.e., I need an ELSE statement... I can't figure out what "language" this is in to look up how to code it, nor do I know what the condition would be labeled (NotLoggedIn, LogggedOut, etc.) Will you help? These are called conditional merges and actually are covered in this article. What exactly are you trying to do? It sounds like you could just put the comma inside the conditional too. Either way, what I see when logged out is "Welcome," and when logged in, "Welcome, Lou" ... Ideas? Thanks. What you have looks correct. I think you are probably logged into the admin. If that is the case the LoggedIn condition is considered true no matter what. Try viewing it in a different browser where you aren't logged in to the admin or in an Incognito/Private window. ...I understand that I can display the entire navigation using $$CATEGORYTRAIL$$. Do this mystery merge code exist, or is there another way to accomplish this? I have the ">" character where you put " " and I am having trouble modifying your script to remove the ">". But I could not get it to perform the way I want it to. We currently utilize the $$CATEGORYTRAIL$$ at the top of our page. I am inquiring about this for a secondary usage towards the middle of the page. This is part of the reason why I was initially hoping to find a merge code that lets me break the trail apart, so that there would be no conflicting scripts on the page. Do you know of a way that I can tell the script to ignore the top merge code and apply only to the one below? The ">" character is store text. The key is "Catalog_BreadcrumbSeperator_string". This should get you where you need to be -- http://jsfiddle.net/BlakePetersen/c2sF4/2/. Let me know if you have any questions on what's going on and I'd be happy to explain. Regarding the reasoning as to why $(this).html($(this).html().replace(/ > /g, '')); failed, the value to be replaced ('/ > /' in this case) is expected to be an html entity expressed in regex (or '/>/'). Also, adding the g after the 2nd slash applies this globally, so it will replace all instances of that regex value within scope. If you kept it off, it would just replace the first item and call it quits. That did the trick! Thank you very much for all of your great input. You both definitely went above and beyond what I was expecting. Blake, thank you for walking me through those scripts. It was a very good learning experience for me and is much appreciated. How do you format a conditional statement with a custom order field? The conditional merge codes on this page are the only conditional merge codes supported, so if its not on this page then its not in the system. However, I think you'll want to look into our Generic Variable Merge code functionality, http://support.americommerce.com/hc/en-us/articles/201904650-How-do-you-use-Generic-Variable-Merges-. With this, you should be able to set a conditional variable merge, and run checks on it later. As always, let us know if you have any additional questions. Are there any other merge codes for gift certificates? I can't get any to show up on the front end in the customer's account dashboard. There are times when I want to serve content ONLY to customers that are NOT logged in AND if not logged in AND cart is not empty, then serve content. BUT if logged in, don't serve. But we can't nest or combine conditionals. A perfect use of this logic would be for an exit-intent popup. This is so incredibly powerful, adding nesting and boolean would take it to another level. Thanks for listening. Is it possible to call an item on a content page and how would I do this. For example I am trying to make a page that shows items based on the industry they are in. I would like to call a specific item and use merge codes to show the items ##SHORTDESCRIPTION## and other things.